FleetCarma » Electric Utility » Are EV fleets the answer to controllable loads and grid efficiency? The adoption of electric vehicles (EVs) is set to grow exponentially. Primarily driven by the reduction in cost compared to the Internal Combustion Engine (ICE) counterparts and generous government incentives to encourage users to switch to EVs. However, increasing the EV fleet puts pressure on global electricity demand. EVs operate via a battery that requires electricity to run. Therefore, the more EVs on the road, the higher the demand for electricity. Bloomberg’s Electric Vehicle Outlook 2018 predicts that the 1.1 million worldwide sales in 2017, will increase ten-fold to 11 million by 2025, 30 million by 2030, and near 65 million by 2040, as shown below. Because of EV growth, global consumption of electricity is set to head in the same direction. The demand will rise from just 6TWh today to 1,800TWh by 2040. While this will only represent 5% of total electricity demand, loads will still have to be managed to mitigate away from peak loads. In the passenger vehicle market, intelligent mobility such as ridesharing, and energy storage can help manage consumption. However, if EV charging is uncontrolled, the increase in use, especially in EV fleets, could be significant, placing considerable strain on the electricity grid, which will most likely result in the need for further infrastructure investment. EV fleet managers should be aware of the consequences of uncontrolled charging, and furthermore, understand how to avoid overloading. Technological developments such as smart charging (V1G) and vehicle-to-grid (V2G) will help manage a vast bulk of the demand in the future. Traditionally, grids have operated under the assumptions that the supply of electricity must be readily available to meet demand. Peak power demand generally occurs in the evening where electricity demand is at its highest. Therefore, optimal EV charging would take place outside of peak hours to avoid unnecessary overcapacity costs. Smart charging or V1G provides this solution by shifting charging time to align with periods of surplus, thus distributing power in the most efficient way possible. The main difference between V1G and V2G is the ability to discharge energy back to the grid, avoiding a situation where a charged EV battery is left idle. Having the option to discharge back to the grid network will help balance the grid at peak times, and create new revenue streams to consumers. Until now, little research has explored the economic impact of smart charging technology. A new study by The Lawrence Berkeley National Laboratory focuses on the potential of smart charging in California. The team at Lawrence Berkeley National Laboratory assume that in California the number of battery-electric vehicles reaches 500,000, and 1 million hybrid-electric vehicles by 2025, consistent with state projections. They comment that the fleet is currently too small to have any significant impact, but as the fleet grows, this is likely to change. 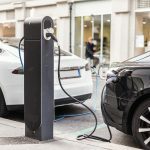 The study claims it could add up to 50GW of load control by 2025, achieved with current technology that connects EVs and charging stations with the local grid network. For example, already in California is the BMW Chargeforward program. The program combines two technologies, smart vehicle grid integration for greater grid efficiency, and EV battery life for stationary storage., and EV battery life for stationary storage. The study also looks at V2G technology, where EVs can also send energy back to the grid for better management and conclude that using the technology based on the fleet assumption would be worth the equivalent of up to $15.4 billion in stationary storage investment. In summary, the study concludes that V1G can provide the same benefit of its storage mandate for mitigating renewable intermittency, but at a small fraction of the cost. Furthermore, V2G will help magnify the gains, avoiding the high capital investments required for stationary storage that can be reverted elsewhere in EV deployment policies. It will be essential to forgo broader analysis to understand the real value of V2G integration to spur future development. Earlier this year, Nissan launched the world’s first V2G integration trial. The project aims to install over 1000 V2G chargers over the next three years. Already fitted, 100 EV chargers in London, UK. Furthermore, eight installed at Nissan’s R&D facility in Cranfield, UK. Supported by UK utility operators and research teams from Newcastle University and Imperial College London, the project seeks to understand the technical characteristics of V2G integration. Nissan believes that a fully integrated UK electricity grid could save £2.4bn in electricity costs by 2030. Nissan Technical Centre Europe (NTCE) has become the first Nissan entity in the company’s network of European facilities to install vehicle-to-grid technology. David Moss, Vice President of Vehicle Design & Development at the Cranfield site said: “The installation of the V2G chargers at NTCE is a significant moment for us. It gives us the opportunity to showcase to the world how the energy management systems Nissan is developing can work in a real-life business situation.” Nissan’s project is significant as it demonstrates in particular how fleet owners can benefit from sustainable and stable electricity management at substantially lower cost. V1G and V2G are all about putting the power into the hands of consumers, providing them with the up-to-date information to make the right decisions. FleetCarma’s SmartCharge Manager puts the power into the fleet managers hands, designing a bespoke package to meet their specific needs. With advanced monitoring and data management, FleetCarma’s platform enables you to track and optimize vehicle charging patterns to ensure a positive return on investment. With complete EV integration, you’re able to use the platform to increase fleet efficiency, reduce operating costs, improve the safety of your drivers, and maximize EV utilization. For more information, you can visit the website. The more the industry trial’s to analyze the effects of V2G integration the better understanding we will have on the potential benefit to fleet managers. Early indications tell us that load management and V2G integration can substantially reduce costs, which is significant when businesses are ultimately concerned with the bottom line. Product and service innovation, such as mobile phone applications, as seen with Jedlix can provide further convenience to consumers and assist in creating an integrated sustainable future.